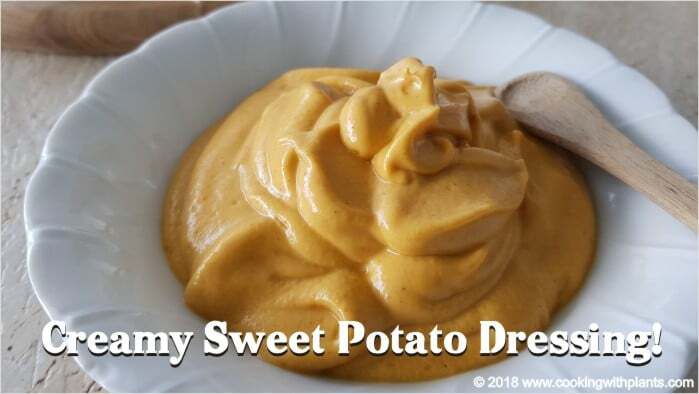 This creamy sweet potato dressing is so rich and decadent… you won’t believe that it’s vegan! It is hands down one of my all time favorite dressings. I love using this on salads, potatoes, pasta and even as a sandwich spread. Looks good. What type of salad would you use this on? Or what other recipes do you have to use this on? Someone else’s kitchen 🙂 Glad you like it. It would be very helpful if your website had a “print” option for your recipes. Thanks. It does, just underneath the star rating at the top of the recipe. I think the image has stopped working. I’ll have to look into it. This sounds delicious! How do you think I could make this fat and salt free? You could use cannellini beans instead of nuts and leave the salt out… use plant based milk as the liquid or water. If I wanted to use garlic granules, what measurement would I use? It won’t taste the same. Maybe start with half a teaspoon and add more according to your taste. Fresh garlic makes it!! Oooh my this is delish!! Now I see why you looked so happy to taste this. I doubled the water to mix well in my vitamix. Yummmmmmmmmmmay!! Making a big lentil bread wrap to eat my salad on this wonderful dressing on. Thanks!! I’m glad you understand my joy! !